Red Loitering Soliciting Trespassing Aluminum Sign | 18" x 12"
No Trespassing Private Property Aluminum Sign | 12" x 18"
Private Road No Trespassing Engraved Sign | 18" x 12"
Warning No Trespassing Beware Dog Aluminum Sign | 12" x 18"
No Soliciting Loitering Trespassing Aluminum Sign | 12" x 12"
Private Property No Trespassing Engraved Sign | 18" x 12"
Post these 12” x 12” signs all over your property and make sure you don’t have unwanted guests wandering around. Our NO TRESPASSING signs are durable and made from the highest quality, heavy-duty aluminum. With the option to choose a laminated outdoor sign, your property will be safe and secure with this posted warning. 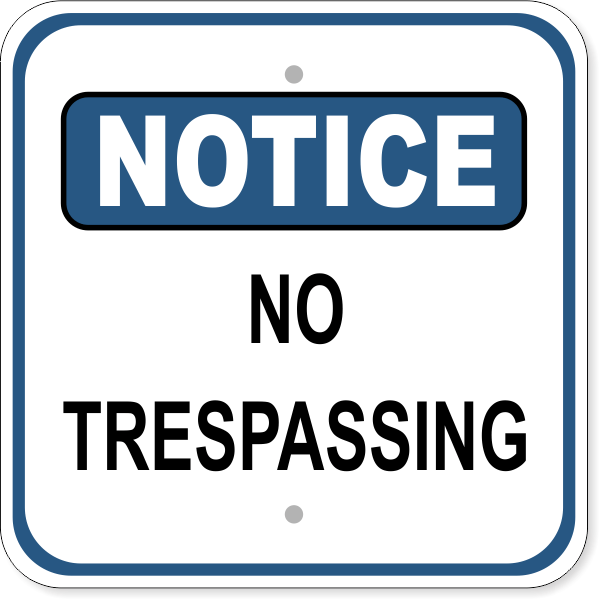 Purchase your NO TRESPASSING Notice Signs from us today!